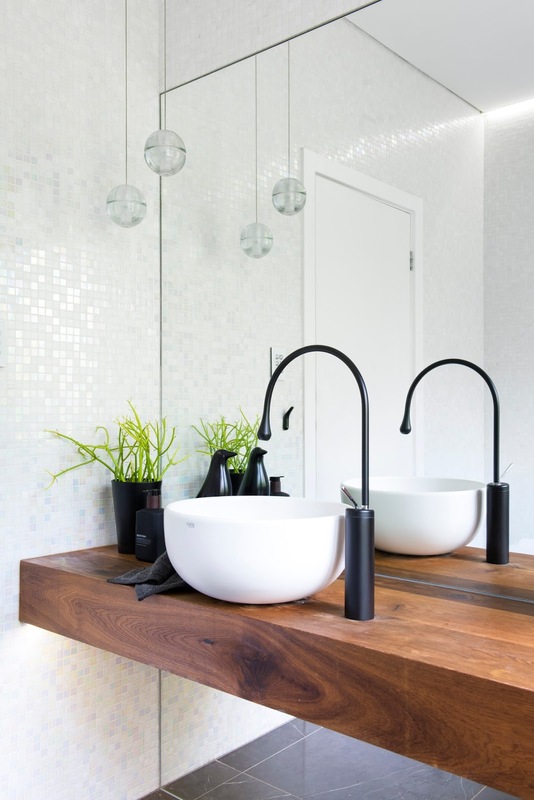 This main bathroom has a dual personality, it has to serve as the homes main bathroom but also has to have that little bit extra punch as it serves as the Guest's bathroom. A little bit a wow was requested for this bathroom design. This 80’s suburban home in Sydney’s lower north shore suburb of Northbridge was in desperate need of a update, a home built in the late 80’s – The home accommodated a professional couple, two teenage boys and a newborn child. The Main Bathroom come Powder room had to be special, it needed quality fixture and fittings to support the wear and tear inflicted by two teenage boys but also be alittle “fancy” for its dual purpose as a powder-room. • Function as both powder and main bathroom. The layout really drove itself as it does in many a small bathroom. Neither window nor door could move, and it made sense both visually and functionally for the bath to sit underneath the window. The door swing was reversed so the door could act as a privacy panel should any intrusion occur. Through further spatial planning the idea formed to make the vanity benchtop connect wall to wall to draw ones eye through the space. This benchtop suddenly became a crucial element to the design. 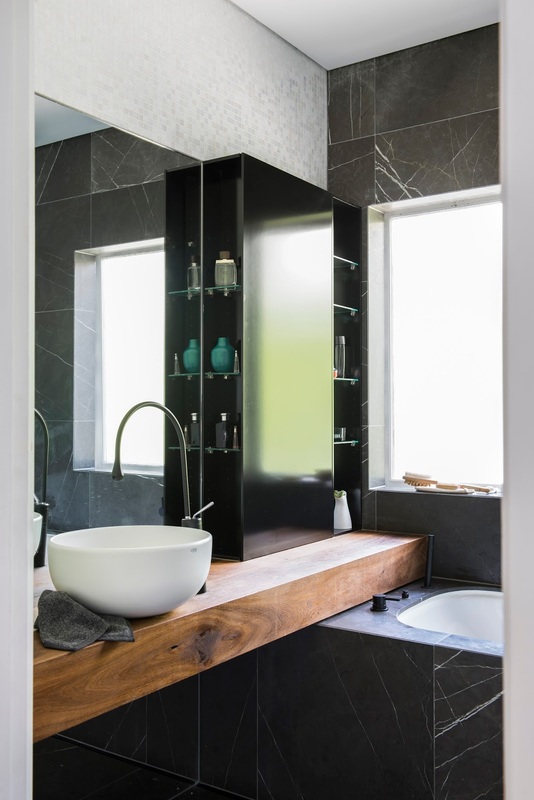 It not only serves as the vanity top but also as a shelf for the bathing area. To combine the warmth element of the brief the benchtop was constructed from the timber flooring being laid in the living areas. The timber floorboard product Mafi has water resistant properties, which made it a great solution to the wet room environment. It was a great contrast to the sleek Pietra Grey marble used on the floor, hob and window wall. Bling was introduced to remaining three walls with a gorgeous Italian mosaic tile from Bisazza. The selection has a glorious coloured shimmer, which reflects the surroundings and varies throughout the day dependant of the light. The wall behind the vanity was covered in mirror floor to door height. This also played on increasing the natural light and also the overall make the space feel larger that it actually was. This elevation also housed the storage for the bathroom. The space had to have a controlled spot for the teenage boys to place their everyday effects; the designer made these spaces small so the boys could not leave their products out messily. These small niches/shelves of storage offer great access and ease of use for both the vanity area and the shower. A larger storage cabinet behind the door offers additional room for the everyday essentials required like toilet rolls and cleaning products. 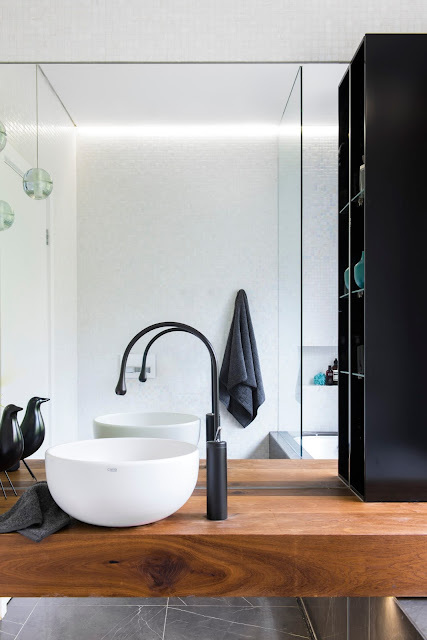 The lighting is layered and very well considered; a motion sensor activates the two Bocci14 glass pendant lights and LEDs under the vanity so guests are not feeling around for a switch. These gorgeous pendants offset the incredible Gessi Goccia tapware and Cielio Ceramic bowl creating a charming arrangement on entry. 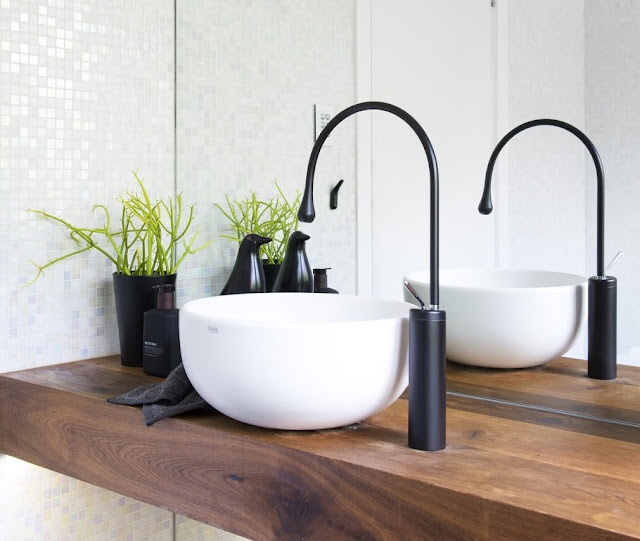 This bathroom is clever and the design utilises the space incredibly well. It is multi functional and caters well not only to the boys’ day-to-day needs, but also to impressing the guests when they visit. The Parents Retreat, the get away space.